Join Back to Natives at Cismontane Brewery in Santa Ana for an awesome Beer Tasting Fundraiser! 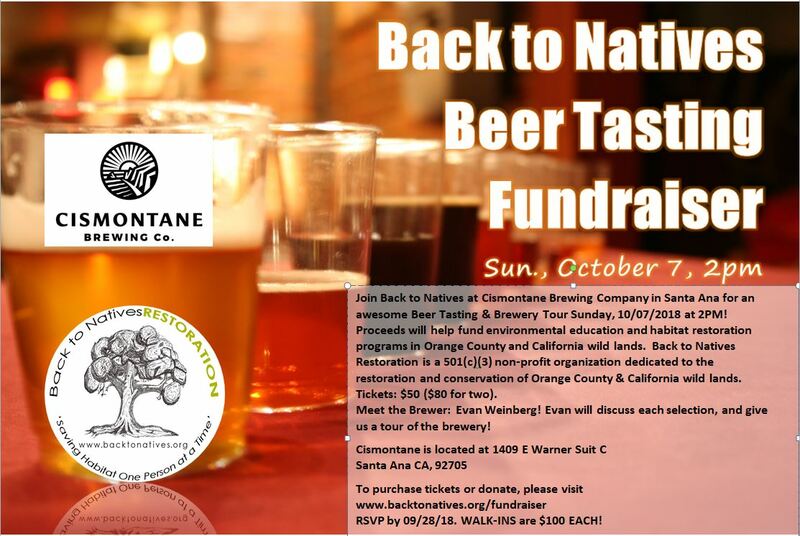 Proceeds will help fund environmental education and habitat restoration programs in Orange County wild lands. Back to Natives Restoration is a 501(c)(3) non-profit organization dedicated to the restoration and conservation of Orange County and California wild lands. Cismontane Brewery is located at 1409 E Warner Suit C, in Santa Ana. Purchase your tickets by SEP. 27 to reserve your seats. This event is always popular, though, so get yours before the sell out! email us if you’d like to arrange alternate payment. RSVP by 9/27/18. WALK-INS are $100 EACH!